The Nike What The Kyrie S1 Hybrid combines elements from past Nike Kyries as well as mixing all three of his signature shoes. 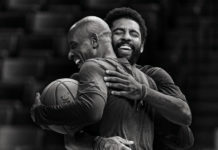 Nike will also be releasing a “Triple Black” version of the Nike Kyrie S1 Hybrid, and this What The Kyrie celebrate what the shoe actually stands for. Dressed in a mix of Brown, Khaki, Blue, Orange, and Black color tones. Graphic inner lining, insole and denim heels adds to the theme, while having “What The Kyrie” spotted on the collar and medial side of the canvas mid-foot strap. The “What The” series is a cumulative celebration of the greatest elements from the greatest sneakers. Enshrining product and people with a legacy of achievements. Paying homage to the individual stories that have collectively shaped the Kyrie legend. The Kyrie S1 Hybrid “What The Kyrie” is a combination of materials, details, and colors from Kyrie’s first three shoes, mixed together to create what he considers the best of the best. This edition takes inspiration from the Kyrie 1, with the bottom teeth and mesh upper highlighted in Vivid Blue – via Nike. Look for the Nike “What The” Kyrie S1Hybrid to release on December 8th at select retailers and Nike.com. The retail price tag is set at $130 USD. UPDATE: First releasing on November 28th at Foot Locker’s Wall St. Sneakeasy location, Nike has confirmed their date for December 8th via Nike SNKRS.